"Mate. What a sensational read. I absolutely loved the book in between airport lounges and on planes I eventually knocked it over, it's fantastic reading about someone you know and grew up with, I'm a stats man too so getting the feedback from games was great, honestly a really well put together book." "Hi Forbes, I just wanted to let you know I finally read the book. I had put it off for a while as I had some other books I was eager to read, and with Matt being a good friend I thought I would know most of the story anyway. However once I started I found I couldn’t put it down. I’ve always admired Matt for getting where he did, but reading the book makes you realise just how hard he has worked to get there. Hopefully the football story is not over yet, and his determination to compete and succeed sees him get yet another shot next season. He is certainly still good enough. Thanks for the enjoyable read." "I know nothing about gridiron so I bought the book primarily to read about Mat. You've told Mat's story in a very engaging way but I was also impressed at the way you've included chapters to educate me about the game and the strategies involved." "I really enjoyed the book Forbes. Well done." ‘An Aussie Takes A Punt’ is now available. 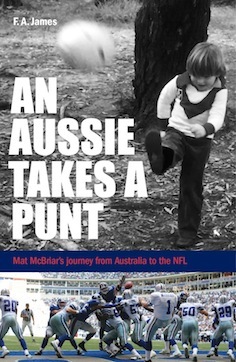 The book tracks Mat McBriar’s amazing journey from Australia to the NFL. Mat is the first Australian to go via the US College system to the NFL and have a significant career there. So far he's played over 130 NFL games, made the Pro Bowl twice and was named as the best Punter in Cowboys history in 2010. If you're an NFL fan you probably don't have much time for Punters. I won't say you hate them - but there's not a lot of love for the poor Punter who has to come on when the Offense has failed. In the book I've explored this relationship and even put a case of why there should be a bit more respect for their work. But this book is really an adventure story - it shows what any young person can achieve if they ignore everyone saying it can't be done. All profits from this book will be donated to charities working with children who have Duchennes Muscular Dystrophy. So far $6,000 has been donated from the initial sales. The price of the book is $A30. Postage & handling for addresses within Australia is $A4. Unfortunately, postage from Australia is very expensive so the cost of postage & handling for addresses outside Australia is $A16. Email info@anaussietakesapunt.com with any queries or for bulk order pricing. MAY 2015 UPDATE: Congratulations to Mat who has just been inducted into the Brighton Grammar School Hall of Fame as a Legend in recognition of his sporting achievements. Mat was the first Australian to go through the US college system and have a highly successful NFL career. His gross average still ranks in the top 10 of all time. Here are a few extracts from the book (all copyright to F.A.James). "Here’s what intrigued me. How does a kid growing up in the suburbs of Melbourne, Australia, a country where only a small proportion of the population knows anything about gridiron, and virtually no-one has ever played the game; how does he end up playing for the Dallas Cowboys, one of the most iconic sporting teams in the World; and how does he go on to be the best Punter in Dallas’s 50 year history? "Mat arrived in Hawaii in late August 2000. He didn’t have a scholarship. All he had was the offer to join the football squad and a place at College to study Economics as long as he paid the fees – and his parents had made it clear that they were only likely to pay the fees for one semester. So Mat’s task was pretty clear – get a scholarship in the first season or go home." "Mat also discovered that the team already had a Punter, Greg Kleidon, who’d been brought in from California on a scholarship. Football squads rarely have more than one Punter. So, from day 1, Mat was asking himself the obvious question - why would a team that already had a Punter on scholarship bother to have a second Punter on scholarship? Adding to Mat’s consternation was that he quickly realized he knew absolutely nothing about the game!" "The next morning he had a letter pushed under his hotel door saying he’d been cut from the team and asking where he’d like them to book a flight to. He could get them to book a flight back to Australia but that would probably be the end of his NFL career - who would want to fly him from Australia for a tryout? He had Erin and her family in Minnesota, but otherwise he had no family, no college degree, no job and only the money left from his short stints in Denver and Seattle." Australia’s Mat McBriar made an excruciating National Football League debut for the Dallas Cowboys yesterday." "In February 2007 they signed a deal worth $US8.5 million with $US2.5 million as a signing bonus and the other $US6 million payable over the next five seasons. In one season, Mat went from being unsure that he had a future in the NFL to being the highest paid Punter in the NFL. And he was off to Hawaii for the Pro Bowl." "The suggested treatment in the absence of any cysts was a combination of rest and bracing of the leg to reduce the pressure on the foot. So Mat was fitted out for a metal brace that would hold his left foot at the appropriate angle. Game 7 was at Philadelphia and Mat attempted to play. He had three punts in the first half that required relatively short kicks. He averaged 38.7 yards and two were downed inside the 20 yard line. The problem was that he could barely stand up and was in immense pain. He’d been prescribed a variety of pain-relievers but none of them was adequate. At half-time he was lying on the floor of the trainers’ room in a foetal position."